Most new writers get a story idea, plan a little about how the story will go, then start writing. I started that way. But I learned by working with my bestselling friends that the first step to development of a story is to create a backstory for my main characters. Then build my story. Let’s start by what I mean by backstory. The question to ask is what brought the character to this moment in time where the story begins? What baggage are they carrying? What past experiences made them who they are today? That’s backstory. It doesn’t have to be distant past. It can be what happened in the last ten minutes. But what makes the story interesting is when I, as the story teller, reveal backstory in layers. The chapter ended with our doctor telling himself there were certain things he purposely left out of the conversation with the family, and he’s rather forceful about it. And we don’t know what or why. And I loved that part and left it alone because I’d turn the page. As the reader, I don’t need, and probably won’t hang around, for five paragraphs of general discussion that the surgery was difficult and there were unanticipated problems and everyone in the OR was worried. So I cut to the chase. I’ll tell you what I told this author. 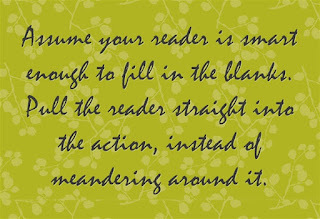 Assume your reader is smart enough to fill in the blanks. 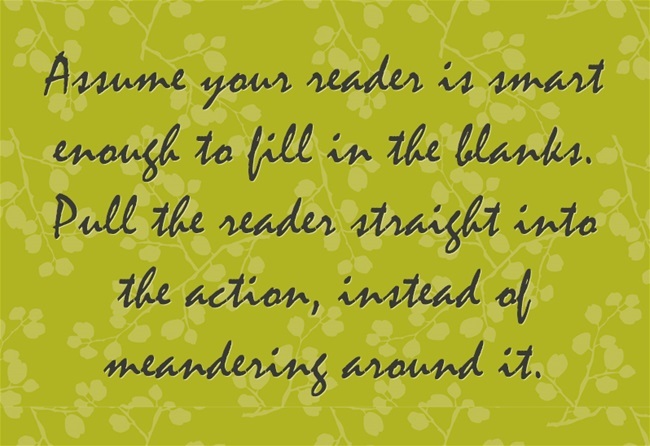 Pull the reader straight into the action, instead of meandering around it. And then plant hooks that have the reader turning the pages. The end of the chapter had a great hook. The problem was without the change I made, it was iffy that the reader would make it to the great hook at the end of the chapter. And we want the reader to get to the great hooks. And yes, I hear you. Bestselling authors, especially those with series books, give the reader a backstory dump all the time. I’ve spent the first two or three pages, sometimes most of the first chapter, reading those backstory dumps in best-selling novels. But keep in mind, those authors have earned that right. And they’ll tell you just as they told me when I pointed it out, it’s better -- optimum -- in fact, to sprinkle the backstory in as flavor the way you put salt on food. Sparingly. In small doses. But sometimes they feel they just have to do it that way so they can get on with the interesting stuff. 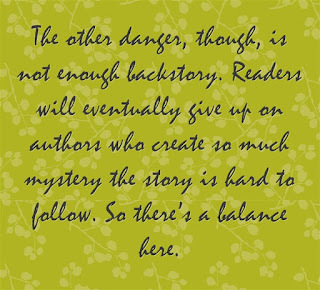 And their readers trust them, so the reader will stay for the scenic route. You and I don’t have that luxury. And I’m not sure I’d take the scenic route even if I could. My favorite part of a book is getting a reader curious, grabbing them by collar and hauling them into the story with things they remember later. In the writing world we call that kind of writing “sticky” – stuff that stays with you when you’re doing other things and you want to get back to the story. The other danger, though, is not enough backstory. 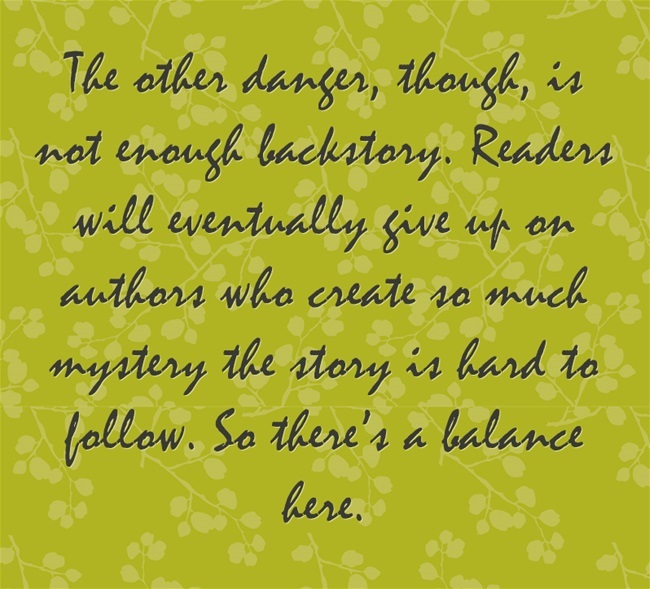 Readers will eventually give up on authors who create so much mystery the story is hard to follow. So there’s a balance here. What I’ve heard, and I like this idea and try to use it myself, is to layer the unresolved conflict questions. Sprinkle in some backstory or create one or two conflicts or mysteries, and as those get closer to resolution, add one or two more. So you always have some conflict or problem going but things are also getting resolved. And the problems don’t have to get resolved favorably for the main character. Most of the time it’s better if the resolution isn’t great and creates another problem. I see this as a kind of a leap frog approach where the problems layer over each other and build to the climax of the story. Like in our surgeon example. 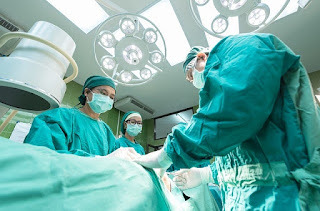 The surgery was difficult, the surgeon has a conflict about his own past and he has to talk to the family. We follow him to talk to the family but the next layer is there’s another issue he’s not telling them about and we don’t know why or what he plans to do about it. So one problem got resolved, talking to the family, but we still have the issue of how the patient reminds him of his own troubled past and the daughter he loves, and now there’s this new layer of mystery. Layers. That’s the ticket. It takes patience and some planning to do this. And working out the backstory beforehand, then knowing when to add it and when not to is an art form. Here’s something I didn’t know. Some authors don’t work out the details of the story before they start. They work entirely on the backstory and don’t worry about the story except for a general framework, until they start writing. And they sell books that way. I know some writers who sell their books on a proposal that is almost entirely the backstory of the characters. Especially when the author is selling a series of books around a group of characters, like a series of three romance novels that feature the story of each of three brothers in a family. I must say, when I saw that style of fiction proposal, I was surprised. I didn’t know you could do that. But when I read the proposal, it was easy to see from the backstory that conflict was brewing, there were difficulties ahead, and I could see several directions for the stories to take. My author friend said very little about where she was planning to go with the three books she proposed. But she sold the series for a nice advance. After she showed me the proposal, she asked me where I thought the books were going. So I told her. She made note of my comments and then said she wouldn’t take any of the books in the directions I'd outlined, but she would use my input. She said the trick, of course, is to play with those obvious directions, then surprise the reader by taking them someplace they didn’t expect to go. She said that’s when it gets fun. I think if it’s fun for the author, it’s fun for the reader. So work on your backstory first. Know your characters and where they came from. It’ll make your work richer and help you sell. About the Author: Linda Rohrbough has been writing since 1989, and has more than 5,000 articles and seven books to her credit, along with writing for television, and seven national awards for her fiction and non-fiction. Find her on Facebook as "Linda Rohrbough - Author" or visit her website: www.LindaRohrbough.com.